CLAYTON — On Thursday night at Northmont High School the Wayne Warriors looked for their second consecutive road win to start the season but were denied 2-0 by the Northmont Thunderbolts. The Thunderbolts controlled most of the first half of play but could not score until 15 minutes remained in the half when a penalty kick was called on the Warriors. Noah Teague did what he does best and put the penalty kick in the back of the net for a 1-0 lead. The second half was an entirely different game as the Warriors came out and played much more physical and created some great chances for themselves. A shot by senior Nathan Johnson just missed tying the game as it bounced off the far post. The Warriors kept playing hard but then Northmont got a perfect pass setting up Noah Teague once again on a one-on-one with the Wayne keeper. Teague scored his 6th goal in the last two games giving Northmont a 2-0 lead. The Warriors had a few more chances but could not get on the board and fell to 2-2-1 on the season. 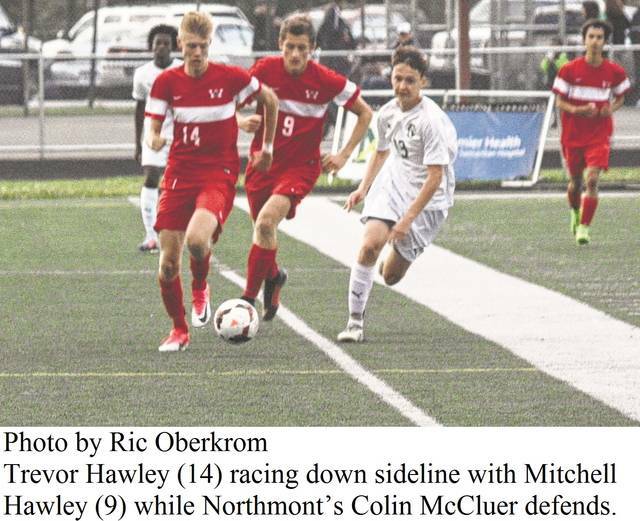 Northmont improved to 4-2-1. Warrior Head Coach Dennis Snider after the game said that the team just did not come out in the first half physically enough and they were not playing well. He then said the second half they played much better and is looking forward to the return of two starters to help them out next week. Junior Nick Riffle who suffered a concussion against Centerville and senior Tri-captain Cameron Picard, who has yet to play a minute this year, will hopefully be back on the pitch this week to bolster the team. Wayne has three home games this week at Heidkamp stadium playing Tuesday, Sept 12 against Springboro, Thursday, Sept. 14 against Carroll, and Saturday, Sept. 16 face Trotwood Madison High School before hitting the road once again to face Miamisburg on Sept. 19. Northmont plays at Springfield on Sept. 12, hosts Beavercreek on Tuesday, Sept. 19, Butler on Thursday, Sept. 21 and Fairfield on Saturday, Sept. 23.